New Yorkers and San Franciscans take deep pride in their city’s culinary superiority, and often disdain restaurants in other locations as not on par. This can be problematic when traveling, if you feel you have to set your palate’s expectations low. But it is definitely not the case at deep blu seafood grille, the signature restaurant at new Wyndham Grand Orlando Resort at Bonnet Creek in Orlando. 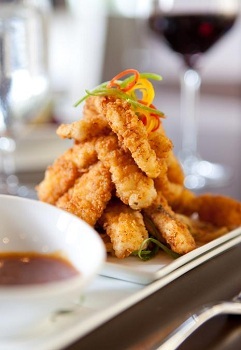 The elegant restaurant, which overlooks the resort’s lush grounds, emphasizes local, impeccably fresh seafood. Adults can have a creative cocktail while kids watch the action at the open kitchen. 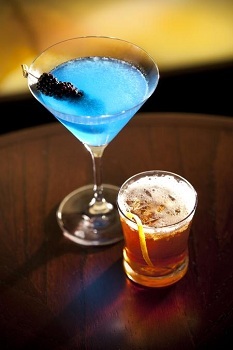 The deep blu martini has a blackberry garnish; there is also a dirty martini with a blue cheese stuffed olive. A raw bar offers a changing selection of raw oysters and clams, but if you are in Orlando with kids (the Wyndham is a stone’s throw from Epcot and offers free daily shuttles to Disney theme parks) you might want to get sushi. New York kids grow up with sushi; it’s practically mashed in with their rice cereal, but I know little kids from all over who love to eat spicy tuna rolls. With that and a bowl of the rich, delicious lobster bisque, many kids will be full. Mine managed to force in a couple of bites of the best crab cake I’ve ever tasted. It was about 99% percent crab, with just enough egg and breadcrumbs to form a loose patty. Other kid pleasers on the menu include the calamari fries, which could convert a non-seafood eater, and decadent macaroni and cheese laced with crab. Tables of adults got orders or the mac and cheese and shared; if your kid gets this, make sure to snag a forkful or two. There is no kids menu, but the reasonably priced and filling appetizers are perfect kid-sized portions. Vegetarians who don’t eat fish can have edamame risotto with shiitake mushrooms, grilled Asparagus with truffle oil and a chile baked sweet potato; there is also a green salad with pear, gorgonzola, radishes and cashews. But if you do eat fish, you will feel particularly good about how ethically responsible the restaurant is. Seafood is listed as sustainable (arctic char, salmon) or local (tile fish, snapper). You choose the preparation: grilled, broiled, blackened or cedar baked, and the sauce, which include luscious Meyer lemon buerre blanc and lobster butter sauce. If you are dieting, you can have impeccably fresh broiled fish with sauce on the side. There are steaks for unrepentant carnivores. Chef Cory York was just named best chef by Orlando Magazine; the restaurant received accolades as Best New Restaurant and Best Hotel Restaurant. Love that Deep Blu. So good and always fresh.